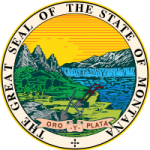 The Montana Child Support Calculator is a worksheet developed by the Montana judiciary for use by the courts and the Child Support Enforcement Division. A parent can also use it as a way to estimate how much they may be obligated to pay or receive in child support payments. But it is just an estimate. The actual order may be different due to different circumstances that may be taken into account. Step 1: Download the worksheet. Step 4: To figure out income after deductions, subtract total allowable deductions from the total income for each parent. Step 6: To get income available for child support, subtract the personal allowance from the income after deductions for each parent.